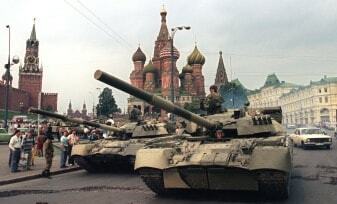 In August 1991, hard-line members of the Communist Party of the Soviet Union (CPSU) who opposed President Mikhail Gorbachev’s reforms and decentralization of government powers tried to overthrow him. The short-lived coup attempt is considered pivotal in the rise of Boris Yeltsin and the eventual breakup of the USSR. 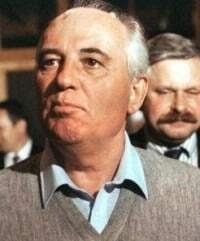 The attempt took place at a dacha in the Crimea, when several high-level officials demanded that Gorbachev resign from power or declare a state of emergency. When he refused, they put him under house arrest, shut down communication lines which were controlled by the KGB, and posted additional guards at the gates to stop anyone from leaving. Gorbachev had tried to liberalize Soviet economic policies, moving from a state-controlled to free market approach, and to democratize the communist political system. He also advocated warmer relations with the United States, winning the respect of President Ronald Reagan. 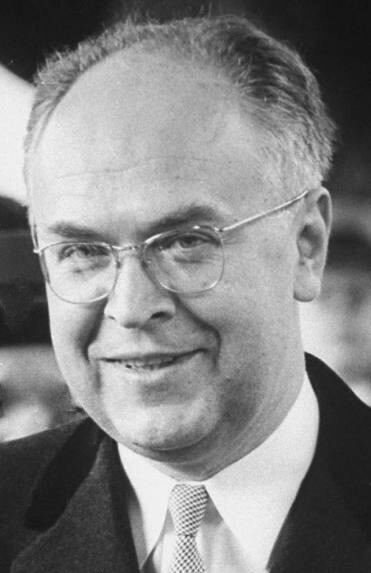 His initiatives were seen less positively by opponents in the USSR; some felt he was driving the Soviet Union to second-class status, others felt the reforms were not far-reaching enough. Among them, Yeltsin resigned from the Communist Party in protest, yet he opposed the coup against Gorbachev and called on the Russian people to demonstrate against it. 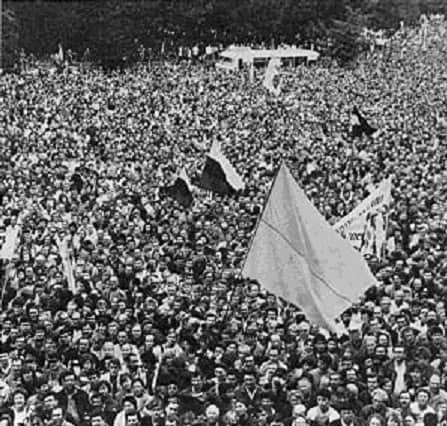 They filled the streets by the thousands, and the coup failed, but Gorbachev would resign by the end of the year in part because of the attempt with Yeltsin emerging as leader of the state of Russia. 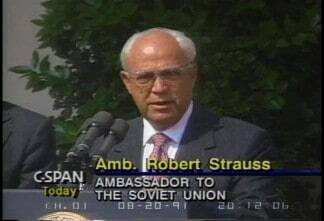 It was a challenging time for Robert Strauss to begin his new job as Chief of Mission at the U.S. Embassy in Moscow. He recounted his launch as ambassador in an interview with ADST founder Charles Stuart Kennedy in October 2002. To read more about Russia and the USSR, about coups, or to read another account of the August 1991 failed coup, please follow the links. I remember I went straight to the embassy and met with the staff. Jim Collins was out there, my deputy. I hadn’t known him before, but he was very highly recommended by everyone…. I thought to myself this is a nice start for a fellow who doesn’t know anything about Russia and even less about the Soviet Union. 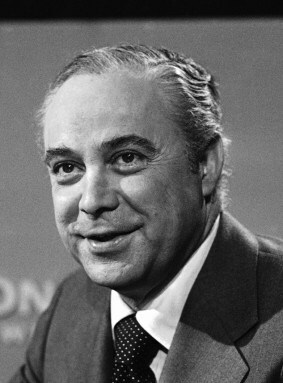 He was the longest-serving ambassador to this country (the U.S.), represented the Soviet Union and was a key player. As a matter of fact, I think Ambassador Dobrynin had much to do with keeping the Soviet Union and the U.S. from coming to blows with each other. It was the kind of communication they, our presidents, had with the Soviet Union; it was through Dobrynin, who told each side what they needed to hear to keep them from each other’s throats. I’ll be damned if two minutes later — you rarely got anybody on the phone in those days when you tried because the system wouldn’t work — I’ll be damned if in two minutes they didn’t have Anatoly Dobrynin on the phone. I said, “Anatoly,” and he started laughing, sort of chuckled the way he did. 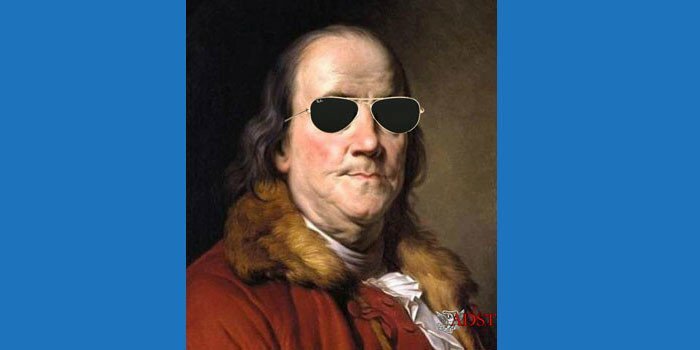 He said, “Bob, the best thing to do is do nothing. I think in 48 hours this coup will all be over. It has no leadership. What little leadership it has, they are petrified and drugged.” He just was very critical of the whole thing. That is what we did…. I remember talking to Scowcroft. I had a long relationship already, and gave him that advice, the best thing to do is nothing. He approved course B. The best advice I could give him: don’t say anything; don’t do anything. Let it play out. They [National Security Advisor Brent Scowcroft and Secretary of State James Baker] obviously were terribly concerned about it, and the best advice they had was that these people simply despised Gorbachev and his reforms, and would do their utmost to get rid of him. But they had serious doubts that they would end up successful…. As a matter of fact, that very day while we were talking, a group of people were going down and thought they could get access to Gorbachev to talk with him, people representing various institutions in the government, including several ambassadors, a couple of ambassadors from foreign countries. I was to go. I hadn’t been there long, but I was on their list to fly down and see him. Jim Collins was to go, my deputy in my place. But there was – consternation is not a strong enough term — there was no panic. George Bush was very calm about it…. There was a negative reaction to Yeltsin from top to bottom, just sort of a left wing radical. You remember there was the press saying at the time that Bush was staying with Gorbachev too long because Gorbachev was already beginning to get in trouble. Just about the time I arrived Gorbachev was getting into trouble, so it was just beginning that. There was no big story yet…. but people thought Gorbachev was a lot more secure than Gorbachev was, is a better way of putting it. And Gorbachev was not as secure as he thought he was. Yeltsin was a major player already… Yeltsin and Gorbachev at that time, on the surface, still had some semblance of a cordial relationship, but it deteriorated quickly. Keep in mind I am talking about August. By the end of the year, on Christmas Day, Gorbachev gave up his job. Yeltsin pushed him out of his job, is a better way of putting it. Yeltsin was the popular figure in the country, no question about that. An interesting thing happened about that. I guess it was about my third day there or fourth day there. They had a big memorial service for three young men who had been killed in the coup. One of them was Russian Orthodox; one was, I think, Baptist, and one was Jewish. They had people from three different faiths there at this big memorial service. When I went over there, Collins didn’t go with me. But Jim Billington of the Library of Congress happened to be in town, and he went along with me…and (he) was very helpful in what to say when we had a chance. When we got there, there must have been, hell I don’t know, how many hundred thousand people. Biggest crowd I have ever seen. I would have estimated a quarter of a million people they had in this big place. They had all the ambassadors from various countries who were going to meet and sit together during this service to show their support for Gorbachev, who had been out of captivity now two days. When Billington and Vera and I and the security guys started walking toward where the ambassadors were supposed to meet, there was something way over towards the edge of part of that crowd, and I turned behind and I looked around. I turned to Vera and said, “Vera, this is just like a Democratic convention. Everybody is in charge, and nobody is in charge, so if you act like you are in charge, you will be in charge.” She laughed. Of course I was exactly right, and we then got right up to the edge of the truck…When I got to the end of that flat-bed truck, the whole Russian power establishment, what little there was left of it, was back there. The first person I saw, one of the persons was Gorbachev. I went over to greet him, and he greeted me. Very warm, and he said he was glad I was there, that he had been expecting me and was glad I showed up. I said, “Well I would like to speak. I have a message from President Bush” He looked kind of stunned and kind of said no. After a half an hour or so, less than that, I spoke….it was a fairly scratchy three minute remarks is all it was….But I remember getting up and looking over that crowd and thinking, hell, this crowd is three or four times bigger than I have seen in Times Square during the Democratic convention. We got through it, and it was played over and over on CNN and other networks around the world. 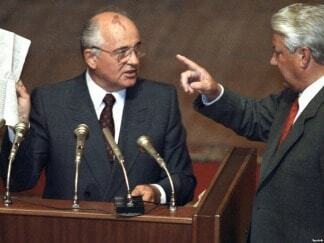 It was very meaningful to Gorbachev. The White House was tickled to death. I talked to Brent Scowcroft. I don’t think I talked to the President then. They were delighted that we showed this U.S. support. So my ambassadorship was launched in a very positive way.